This condition, which also is called Wheat Pasture Poisoning, Grass Staggers, and Hypomagnesemic Tetany, is most common in cattle grazing succulent spring grass pastures or fall cool-season grass pastures and winter annuals that contain high levels of protein and potassium. A less common form of the disorder known as Winter Tetany occurs with the consumption of poor quality, magnesium–depleted forages such as dormant winter pastures. Grass tetany occurs when the level of magnesium in blood falls below a critical threshold (below 1.2 mg per 100 ml). The incidence of this disorder varies greatly among herds, but in extreme conditions can be as high as 20%. Cattle diagnosed with grass tetany can have death losses exceeding 30% if not treated promptly. The potential economic impact of grass tetany is therefore large. Onset of the disease is rapid, and death may occur in as little as six hours after the first appearance of clinical signs. Marginal deficiencies of magnesium, though not life-threatening, are less visible and also may have substantial economic consequences due to poor animal performance. 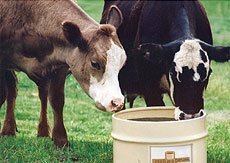 Providing a palatable magnesium supplement with high biological availability is an effective strategy for meeting magnesium requirements of grazing cattle. Lactating cows are most susceptible to grass tetany, especially in the first few weeks immediately after calving. The disorder also can affect non-lactating females, calves, and yearling cattle. The predisposition of lactating cows to tetany is driven by the higher magnesium requirements associated with milk production. Sensitivity to magnesium deficiency also is a function of age. Incidence of the metabolic disorder generally increases as animals become older, presumably as a result of their inability to rapidly mobilize magnesium stored in the bones. Younger animals can mobilize bone magnesium more readily, and are therefore less prone to develop critical deficiencies that lead to grass tetany. Grass tetany is relatively rare among cattle grazing pastures that contain a high percentage of legumes such as clover or alfalfa, because these forages typically contain more magnesium than grasses. Succulent, vegetative grasses found in early spring pastures, fall regrowth pastures, and winter annuals (such as wheat, rye, and ryegrass pastures) frequently do not contain adequate concentrations of magnesium, and therefore must be supplemented to achieve optimal performance and to reduce the incidence of grass tetany. Poor quality hays, straws, and weathered forages also can be magnesium deficient, and should be supplemented accordingly to avoid complications with winter tetany. The biological availability of magnesium sources is influenced by a variety of factors. Magnesium oxide, though relatively unpalatable, is an excellent source of magnesium for cattle. On the other hand, dolomitic limestone is a poor source of magnesium due to its low biological availability. (See figure 1.) Absorption of magnesium by ruminants is influenced by the frequency of feeding. Compared to feeding once per day, magnesium absorption is more than doubled with continuous feeding. 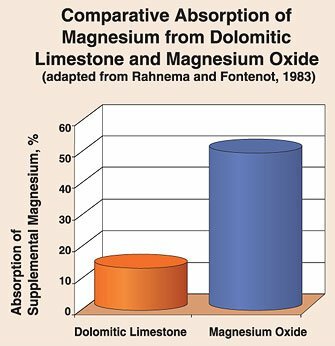 Feeding supplemental magnesium in conjunction with small levels of readily available carbohydrates (sugars) increases absorption dramatically, and has the additional advantage of helping to disguise the objectionable flavor associated with many sources of supplemental magnesium. Giduck, S. A. and J. P. Fontenot. 1987. J. Anim. Sci. 65:1667. Grace, N. D. and J. C. MacRae. 1972. Brit. J. Nutr. 27:51. McDowell, L. R. 1992. Minerals in Animal and Human Nutrition. Academic Press, Inc. San Diego, CA. Rahnema, S. H. and J. P. Fontenot. 1983. J. Anim. Sci. 57:1545. National Research Council. 1996. Nutrient Requirements of Beef Cattle, 7th Revised Edition. National Academy Press. Washington, D.C. 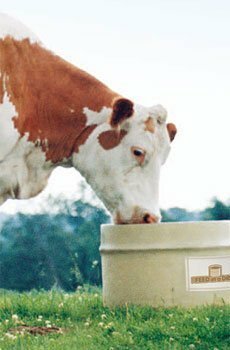 The Feed In A Drum® supplements meet the challenges of forage deficiencies head on. Issues like grass tetany have a major impact on a producer’s profitability. 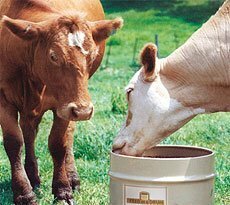 The Feed In A Drum Supplements are carefully formulated to address deficient pastures and help producers become more efficient and profitable. MinLic®, High-Mag Natural 15, High-Mag 20 and Fescue Balancer can help your herd get the most out of deficient pastures. These supplements are fortified with high levels of essential vitamins and minerals, including extra magnesium, to enhance forage utilization and reproductive performance.